In “Noobs vs Leets,” designed by the Games for Learning Institute (G4LI), each new level focuses on a different geometry concept. 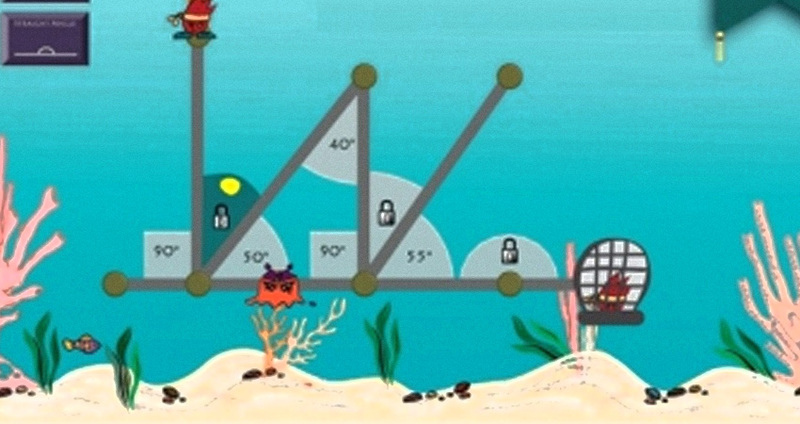 The player unlocks angles using their knowledge of various angle types in order to create a path through the puzzle and save their trapped friends. Digital games have become an integral part of the daily lives of millions of individuals, and are increasingly recognized for their potential as environments for supporting learning. In fact, with their vast popularity and singular ability to engage young people, digital games have been hailed as tools that may enable a new paradigm for education. Because of this great potential, as described at the recent NYU Teaching with Technology Conference, Courant computer scientist Ken Perlin and I have joined with colleagues from six other universities to explore their educational use and to guide their creation through empirically-supported design patterns. With support from Microsoft Research, we formed the Games for Learning Institute (G4LI), where we study games for learning, develop design patterns, build game prototypes, and test them in a variety of learning settings. Here we give an overview of the reasons and ways that games can be effective tools for pedagogy, followed by a summary of some of the G4LI’s current research projects. Unlike many classroom-based learning experiences, video games allow students to apply their knowledge in complex and varied contexts. For example, when playing through a level of Portal 2, a popular sci-fi video game, the player is challenged to analyze the constraints of the area around them and solve spatial puzzles. This experience leverages the player’s knowledge of physics and their ability to apply this knowledge to the game. Likewise, LittleBigPlanet 2 introduces tools (e.g., a grappling hook) and then provides a wide range of situations and contexts in which players learn the proper use of those tools. Through these types of rich in-game interactions, video games can situate students in authentic experiences, allowing them to expand and apply practical knowledge. Rather than having a single, generic experience that may cater only to a particular type of learner, games have the ability to adjust gameplay based on the players’ past actions and decisions. A player’s game experience can be tailored to their preferences and performance; not only can players choose the options they prefer, but based on gameplay metrics, the game can automatically change difficulty and rewards. In commercial role-playing games (RPGs) like Dragon Age, for example, players will have a dynamically different experience depending on the type of character they pick, along with the decisions and conversation options they choose within the game world. Applying these concepts to a learning game, the players’ ability to correctly solve problems or identify and apply relevant concepts within the game space determines the types of challenges the game will present to them in the future. If a player is struggling with a learning concept, the game could adjust by presenting the same concept in a different context or by decreasing the difficulty level until the player has demonstrated mastery of that skill or concept. Similarly, if a player seems to be successfully employing a particular problem solving strategy, the game could present new material within that familiar framework. After the player has demonstrated mastery of the material, the game could then follow up with new frameworks. By balancing gameplay enjoyment with an appropriate level of challenge, games have the ability to keep players in their own unique optimally challenging and engaging zone for learning. CREATE Lab staff Melissa Biles, Nikolaus Hajny, Elizabeth Hayward, and Susan Letourneau at work. Image courtesy Tsu-Ting Huang. Video games are easily accessed anywhere—on computers at home, school, and everywhere in between (including cell phones and tablets). By not limiting educational opportunities to time spent in the classroom, games can bridge learning environments across many settings. Subsequently, a lesson started in school can be played on the bus ride home and then continued on a home computer. Since games can be designed to have embedded assessments, teachers could keep track of students’ progress playing educational games as homework. Students learn better when they are actively interested and engaged in the subject matter at hand. Although the learner is often treated within the classroom as a purely cognitive being, the thinking process cannot be separated from feeling. Even conventional learning materials, such as homework and quizzes, evoke an emotional response, though often a negative one. Our research has shown that learning is facilitated when students are in a positive emotional state. Video games can create such a positive emotional impact through compelling design of narrative environments. Uncharted, for example, is a popular action-adventure game series revolving around the exploits of treasure hunter Nathan Drake. The game creates a compelling element of adventure by taking the player through dank dungeons and crumbling ruins. By situating the player’s decisions within this very detailed and realistic world, the game imbues the player’s choices with gravitas. Likewise, in the interactive narrative game Heavy Rain, players are presented with morally-ambiguous situations that require them to engage in a decision-making process. The emotional impact of such games can cause the players to become more motivated and involved in the learning process, which means they are more likely to remember the “how” and the “why” behind the particular decisions they make. One of the most powerful features of games is that they bring together individuals with common goals. Popular games such as World of Warcraft, for example, spawned online communities with hundreds of thousands of contributors. It has been argued, therefore, that much of the actual learning happens outside of a game, through the discussion of player strategies, development of documents with virtual walkthroughs, and formation of governance structures within these communities that engage players in activities not unlike the management of a small business. From an educational perspective, many of the skills learned in these communities are beneficial, but not typically taught in schools. One of the challenges in traditional educational environments is the assessment of learning outcomes. Conventional assessments are typically given once, after a period of learning, and therefore represent only one perspective of a learner’s progress, rather than tracking their progress throughout their learning experience. Games, by comparison, allow learning to be monitored and tracked in real time. Each action a player makes in a game can be logged, contextualized, and matched with learning standards, such as the common core, to gain a deeper understanding of the player’s mental models. This is seen in many games that allow players to collect and analyze statistics, such as real-time strategy (RTS) games like Starcraft 2. By providing a constant stream of valuable information during gameplay, games allow continual monitoring of learning as a process—not simply the learner’s ability to perform at one point in time. 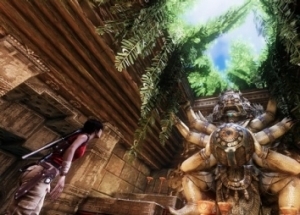 In the popular “Uncharted” series, players experience action-packed gameplay and challenging puzzles inside ancient temple ruins. Well-designed games that integrate some or many of the above ideas can make very effective learning environments. But what can research tell us about the design of good games? A first step is the consideration of the function of a game in the learning process. In the course of the G4LI’s work, we have developed the following heuristic: Does it prepare future learning by providing students with a shared experience the instructor can reference? Does it introduce new concepts and skills, or is it designed to practice and automate existing concepts and skills? Is it designed to teach important life skills such as team collaboration, creativity, or problem solving? Once the function of a game for learning has been clarified, a myriad of other design decisions remain. NYU has played an active role in contributing to research and development that furthers the efficacy and understanding of these choices. The Steinhardt School’s Consortium for Research and Evaluation of Advanced Technologies in Education (CREATE) lab, for example, conducts research on the design, critique, and evaluation of a wide range of advanced digital technologies for learning. At the CREATE lab, interdisciplinary teams of scholars and developers work together to identify the optimal design elements of digital materials to use in a variety of formal and informal educational settings. Projects include game design for science, technology, engineering, and mathematics (STEM) learning, educational game design for mobile devices, chemistry simulations for high school students, the development of a computer programming game for middle school girls, and the construction of interactive tools for medical education. Many of the projects underway at the G4LI benefit from collaborations of diverse groups. The Mathematics Fluency Data Collaborative, for example, is a G4LI project led by Carnegie Learning and in collaboration with Game2Learn at the University of North Carolina, Charlotte; the Pittsburgh Science of Learning Center at Carnegie Mellon University; Pellissippi State Community College; and PlayPower. These diverse contributors bring together their expertise in mathematics education, cognition, game design, and data mining to build a research and development platform for creating, refining, and distributing high-quality mathematics games. This project aims to dramatically improve performance in developmental mathematics courses by building games that help students acquire the skills to succeed in mathematical problem solving. The games address issues related to the challenges around open source courseware, as well as blended learning, learner analytics, and student engagement. Another G4LI research initiative, the Create to Learn Network (C2L), aims to foster the development of creativity, innovation, inquiry, and math competency in middle school students through game design. Under the guidance of researchers, students from the Urban Assembly Institute of Math and Science for Young Women take on the roles of designers, innovators, and evaluators of learning games. This project is founded on the belief that creation and innovation require inquiry; it is important to have actively involved students evaluate their own game designs through reviews, testing, and empirical study of game effectiveness. Other G4LI collaborative projects involve designing and testing games that aim to foster early literacy skills in four to six year olds (Microsoft Game Studio collaboration) and a real-time multiplayer game for the New York Hall of Science designed to raise awareness of the economic, social, and environmental factors that influence sustainability. From our work it has become clear that research and development in the area of digital games and learning requires collaborative, interdisciplinary, and transdisciplinary teams. G4LI and CREATE serve as examples of NYU initiatives where such collaboration has come to fruition. For details about these and other G4LI games and research, as well as information about how to initiate collaboration with the Institute or apply this work to your own pedagogy, visit the Games for Learning Institute’s website (www.g4li.org) or contact Jan Plass at jan.plass@nyu.edu. For more information on the CREATE lab, see the sidebar, and visit www.createlabs.org. 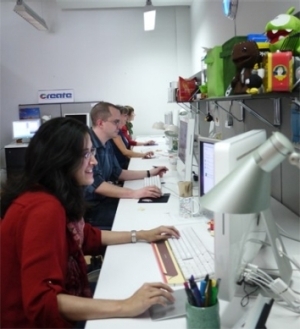 CREATE is a member lab of the NYU-based Games for Learning Institute (G4LI), which brings together game designers, computer scientists, and educational researchers from a total of seven universities, with support from Microsoft Research. G4LI examine issues related to the art and science of designing effective and fun games for learning. The intricacies of game design are approached from multiple angles using advanced research methods, such as eye tracking, biometrics, video analysis, and game telemetry, to develop theory-based and empirically-validated design patterns of effective games for learning.